A client asked me to make a reproduction of one of the Honey Lane seaxs and this is the result. The Honey Lane seaxs are a series of excavated blades found during building works in London in housed in the British Musem. One of these is 'the one with the bent tang', that has caused much speculation as to whether it was made like this or damaged. It is now generally assumed to have been damaged. My client asked for a reasonably high status knife with an 8" blade and we decided to inlay as per the original in silver and copper and so made the blade to suit with a wrought iron back and a shear steel edge. The blade was of course made by Owen Bush and the rest is by myself. 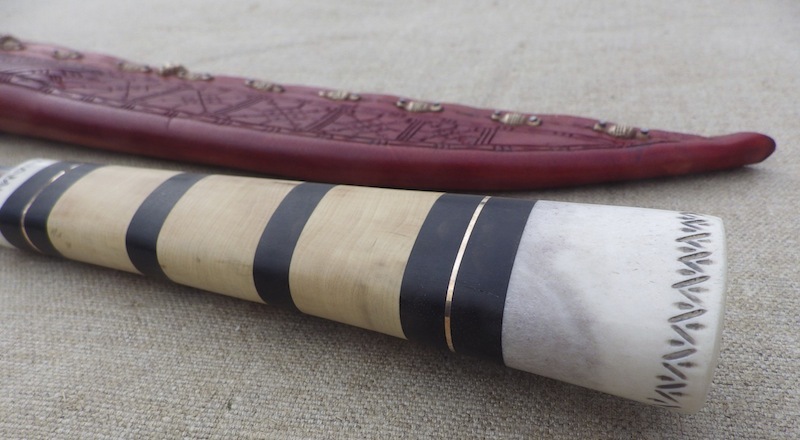 The handle is of course more speculative and has been built as a stack of elk antler, ebony, bronze and box wood. Clearly ebony is not of European origin, but with the extensive trading links this is entirely plausible. Either way it has also been made long, which again goes along with current thinking. The scabbard uses elements from a couple of scabbards from Coppergate in York. I hope you like it and of course any questions are very welcome. Very, very nice work from both of you. Inspiring. Ohhh good grief! Yummy. Its like a krispy creme donut 12 pack in historical cutlery form. 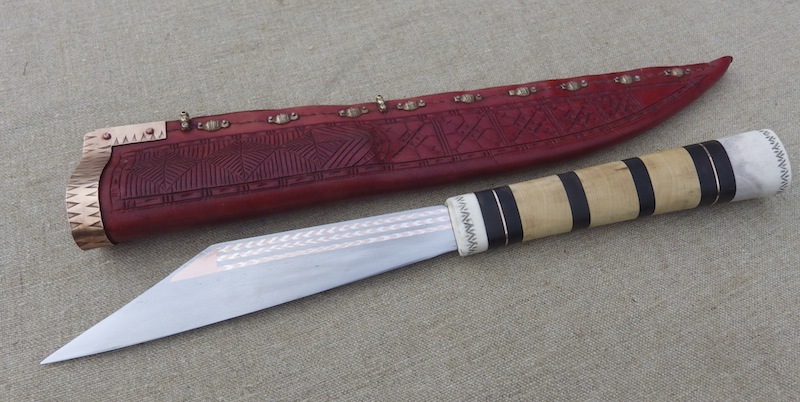 Gorgeous blade, gorgeous grip, phenomenal scabbard. Love that color! You've conditioned me like Pavlov's dog. The quality of your work is so astounding, I start to salivate when I just see your name on a post, knowing that there are beautiful images to follow. Just plain AWESOME! I love the blade. The inlay is great! Sheath is great! It's all GREAT! Well done. I like how you have followed the back line into the handle. i just posted up else-where here in the forum how much i like copper inlay - and to me the best combination is copper and steel. 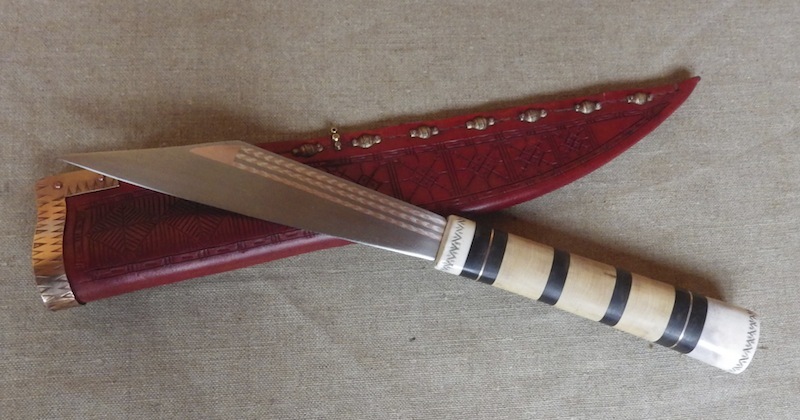 Love the inlay, and the sheath looks great too. 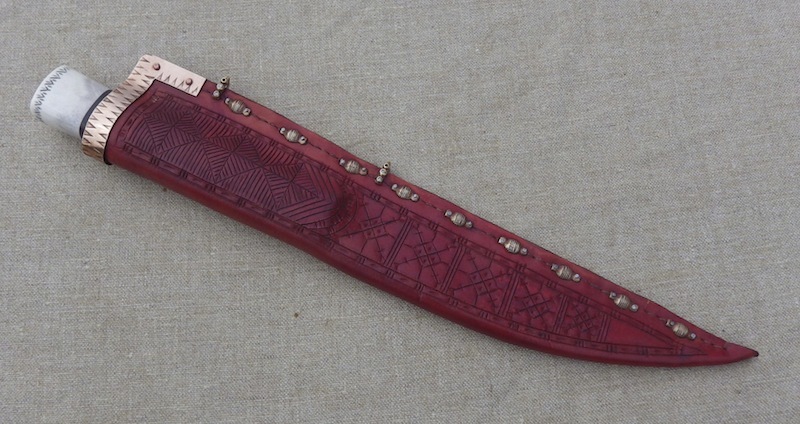 The metal fittings on the sheath are quite intriguing, actually... are they based on an existing example? The metal fittings on the sheath are quite intriguing, actually... are they based on an existing example? The scabbard mouth shape is taken from a Coppergate piece, though this fitting was in fact in iron. The fittings along the scabbard itself are in fact slightly later bar mounts, but they are very similar to found scabbard mounts from seaxs in Birka. Oh, to see this piece in person would be superb.